Langhorne Rotary news - Times Publishing Newspapers, Inc. The Langhorne Rotary Student of the Month for March was Jazalynn Grocholski, a senior in the Allied Health program of the Bucks County Technical High School. She is currently serving her clinical hours in a nursing home. Her teacher notes that she is personable, compassionate and knowledgeable in her skills. Jazalynn has been a member of the Key Club and has participated in the largest event of the school, the MiniTHON, raising money for Diamond Foundation that raises funds for dealing with childhood cancer. She not only plays softball at the school but maintains a challenging academic roster. The Langhorne Rotary held their meeting at the Technical School for the presentation and enjoyed the opportunity to have lunch prepared and served by the culinary students. The Rotary theme for this year is “Be the Inspiration.” Each month the club has recognized a member of the community as our Person of Inspiration. In February the recipient was Bill Gilmore, who has a history of being involved in the civil rights movement and served for many years as Mayor of Langhorne. For March the club recognized two women who work together at the Pennwood Library in Langhorne. 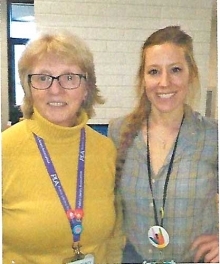 Judy Benfield is the Library Manager and Jessica Richmond is the Youth Service Librarian. They have worked together in reinventing library usage with numerous innovative learning activities for a multi-purpose building that attracts patrons of all ages. They have led the team of librarians that are considered an inspiration for librarians everywhere. On February 21st the Langhorne Rotary inducted its newest member, Scott McCrea. Scott is a financial advisor with Edward Jones. His office is in Southampton and he resides in Churchville. PHOTO CAP: Pennwood Library Manager Judy Benfield (left) and Youth Service Librarian Jessica Richmond.